When you buy a 2016 Toyota 4Runner, you get two vehicles for the price of one. On one hand, the new 4Runner is a luxuriously-appointed people-hauler that treats everyone inside like a VIP riding in a parade. On the other hand, the new 4Runner is an intrepid and fearless body-on-frame SUV with legendary off-road capabilities. Other SUVs on the market look like the 4Runner, but they cannot perform like it, because a crossover SUV does not have the heavy-duty construction or the guts of the 2016 Toyota 4Runner. Do you watch 4x4 truck commercials on TV just to see if you've been on that patch of road? Do you think pavement is overrated? Drop by Family Toyota of Arlington for a test drive of the new 4Runner that you will not soon forget. We are conveniently located at 1661 Wet N' Wild Way in Arlington, TX, near Arlington, Mansfield, Grand Prairie, Fort Worth, and Irving. At Family Toyota of Arlington, we always go the extra mile to make sure you are completely satisfied - and we never give you the run-around when it comes to follow-up service. The 4.0L V6 engine puts the 4Runner through its paces, with a sizzling 270 hp and 278 pound-feet of torque, and leaves all those car-based SUVs in the dust. A common misconception is that all Toyota 4Runners are four-wheel-drive vehicles, when in fact, the rear-wheel drive option has become the choice of younger consumers. Standard equipment includes skid plates and mud guards, even on the base SR5 trim package, so you know the 4Runner was made for tough terrain. Four-wheel-drive models of the Toyota 4Runner give you hill-start assist and hill-descent control to keep you in complete control of the inclines. Are you ready for the 4Runner TRD Pro edition? The next generation of family-friendly SUVs is here, and the 4Runner TRD Pro leads the pack. With Bilstein high-performance shocks and trail-tuned springs, the TRD Pro can tame the toughest trails and take you to places other SUVs fear to tread, providing a smooth, comfortable ride even in the Texas badlands. To fortify the body-on-frame strength, the TRD Pro's hefty quarter-inch aluminum skid plates help protect the undercarriage. The interior is to-die-for: rich upholstery with contrast stitching; a leather-wrapped gearshift knob; and bright dashboard displays and gauges. Head-turning accents on the 4Runner TRD Pro include a redesigned grille, black alloy wheels, and all-terrain tires, but even if you don't get the TRD Pro, you can get many of its accessories and trim options on other 4Runner models. That is where the friendly and knowledgeable staff at Family Toyota of Arlington can help. Let us show all the available variations and looks of the 2016 4Runner. 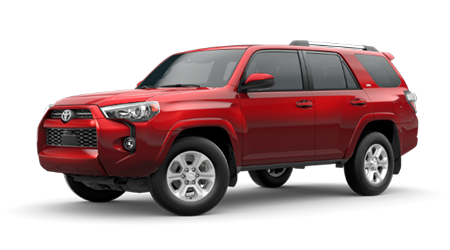 Come to our spacious showroom at 1661 Wet N' Wild Way in Arlington, TX, for a test drive of the fearless Toyota 4Runner. We currently have a nice selection of new 4Runners in stock, and we urge you to bring your whole family to Family Toyota of Arlington for a first-hand look. We happily serve Arlington, Mansfield, Grand Prairie, Fort Worth, and Irving and beyond, so please make us your destination dealership for sweet deals on a new or used Toyota. See you soon!